Is your Delonghi space heater switch fried? You may need a new double rocker switch to get your heater back to work(nobody wants to be cold). This original equipment switch is a double rocker design, with six electric spade terminals, and is ready to bring your space heater back to working condition. Delonghi's part # 512869 (also 5108001100) switch allows you to keep your environment at a comfortable temperature. 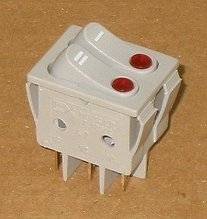 This heater part fits many Delonghi space heaters. CH15 CH15F HM15 HM24W HM25 2507 2507T 5108 5108T 5307 9306 9308 9608 9707T.